1.The start of markup is identified by either the less-than symbol (<) or the ampersand character (&). 2. 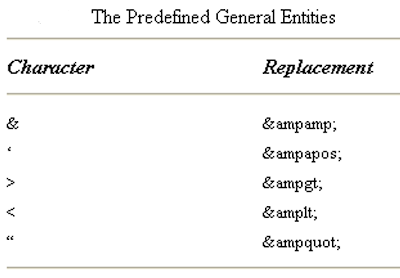 Three other characters are also treated as markup characters: the greater-than symbol (>), the apostrophe or single quote, (‘), and the (double) quotation mark (“). 3.If you want to use any of the preceding special characters as normal characters, you must “escape” them by using the general entities that represent them. To escape a character means to conceal it from a subsequent software package or process. It is often used in computing terms to refer to prefixing certain characters in programming languages with a special character string to prevent them from being interpreted as special characters. Originally the ESC (escape) character string was used to prefix commands sent to the printer itself to control such things as the font or page size and distinguish the command strings from printable characters. 4.Everything that is not markup is content (character data). The following code shows the XML code for a Web home page. This is a very simple example, but it contains all the important parts that you will find in nearly all XML documents.